One of the many things Jem and the Holograms is most noted for is being created for the sole purpose of marketing toys to children. Of course, that’s the case with just about any cartoon when you get down to it. Since Jem was created based on a line of already existing dolls and a bit of a story line, their toy line is quite vast. Although Synergy is more of a computer (“the ultimate audio-visual entertainment synthesizer,” to be exact), a doll version was released sans computer. She eventually runs around outside of her computer home, but it just seems strange to even release her in doll form. Long before the only wallpaper in modern homes was found behind a desktop filled with unorganized and unused program icons, people dressed their houses in sheets of paper filled with tacky designs. And what could be more totally outrageous than a black background with eye-bleedingly bright characters on top of it? The answer is nothing. Not wanting to waste precious product, Hasbro sold leftover doll parts to a company called Star (or maybe Star acquired these parts through nefarious means. Who really knows). Someone at Star had an odd sense of humor and began packaging Frankenstein monster dolls—discount dolls made from a variety of Jem character parts and outfits. Mismatched heads and bodies? Sure! Male head on female body wearing competing band’s stage dress? It could happen! And it evidently did. Voted best bus companion, 1987. Jem had a pet llama, but it never appeared on the show. A llama is a strange choice of pet for many reasons, especially for Jem, who would be on tour with a 280-450 lb. smelly llama. I’ll bet the Holograms loved her for dragging that thing on the bus. 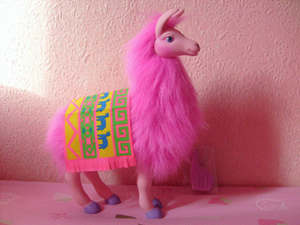 Rama Llama was a mail-in offer and was re-marketed as part of the My Little Pony line later by Hasbro, because as we all know, Hasbro is all up on re-using toys. Maybe it isn’t a ridiculous release, but I find it ridiculous that I paid $50 each for the first two DVD sets a few years ago only to have Shout release the entire series (including the seasons that remained previously unreleased on DVD) now. And yes, I spent $85 on it when it was released in October. 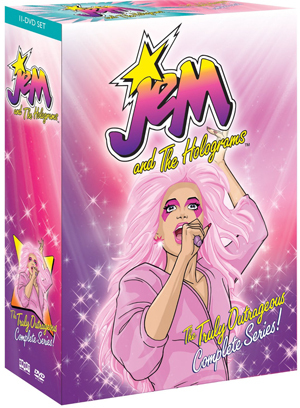 What are some of your favorite Jem and the Holograms products? 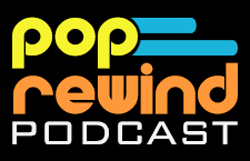 Don’t forget to comment and share! @smurfwreck Have you seen the new Synergy doll? Gorgeous! 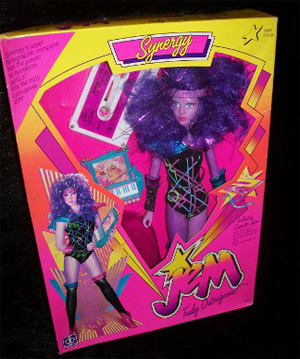 Those new Jem dolls are going to be a detriment to my wallet. I’m trying to be good and just hold out for Stormer, but it’s so tempting to get them all. Who needs to pay rent, psh!